We are thrilled to share this review by Howard W. Blake High School theater performance major Hannah Lehrer. #BHSReviews is an initiative of students reviewing Tampa Bay area productions while encouraging their peers and classmates to support and attend more live theater. Reviews are not an official endorsement by the school but the opinions of the reviewers. We have only made very minor edits to this review for clarity. Hannah’s original review may be found on her Instagram account hlehrer.reviews. Student reviewers are offered free tickets to attend our plays. Jobsite also offers students $18 rush tickets to any performance with availability as of 30 minutes to curtain, and we regularly offer groups of 10+ students access for as low as $10 per person inclusive of a pre-show tour and/or post-show Q&A with the team. I think it’s fair to say that we all remember studying the poetic genius William Shakespeare brought to the table throughout our educational careers. An endless supply of sonnets, tragedy, and hysteria; yet we rarely take time to acknowledge the true depths of his work. Luckily, The Complete Works of William Shakespeare (abridged) [revised] allows both an appreciation and a comedic play by play of almost every major show “The Bard” pumped out. This particular production was wildly entertaining as each actor brought a varying level of comedic timing and childlike energy. For those out there who love the slapstick comedic style of 1920s vaudeville, this is surely the show for you. The show opens with actor David M. Jenkins, as he introduces the audience to the fast-paced nature of this farce. Jenkins first appearing rather meek, develops a quick-witted nature as he reenacts iconic roles in Shakespeare’s most prominent works. Often appearing as the male lead, he plays into the questionable femininity of Elizabethan characters, along with the modern, simplistic mindset of a stereotypical man. This adds for an exciting juxtaposition between actor Spencer Meyers, who took a masculine approach to imitating Shakespeare’s most famous women. Whether it was the young and lovestruck Juliet, or the naive and impressionable Ophelia, he managed to bring about a curious sense of playfulness that was quite amusing. I, for one, thoroughly enjoyed his character’s immature outlook on Shakespearean women, as it reflected a realistic interpretation of what the average person may interpret. Shawn Paonessa, playing the Shakespearean scholar of the group, fantastically embodies a captivating “straight man” as he keeps the story pushing forward with his insightful narration. Yet, much to my surprise, he too would get in on some of the shenanigans, adding a more serious dynamic to the tongue in cheek comedy. However, there was one moment in which I found his performance to be particularly intriguing. During act two, a woman in the front row became rather vocal about the performance, and as only a true professional can, he slipped in a well-timed jab which scored countless laughs from the audience. In my eyes, this stole the show as there is nothing better than a quick lesson on theater etiquette while remaining completely in character. With the nature of this show, it only makes sense for the three actors to have electric timing and an inseverable bond. 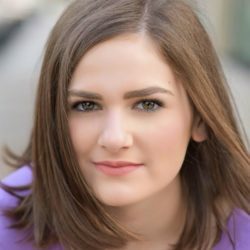 From a directing standpoint, I owe Katrina Stevenson a huge round of applause as she was able to hone each actor’s innate ability to work exceptionally well with one another, while conveying a hysterical story line. Almost every joke landed with perfect precision yet remained organic and in the moment. This is far from an easy task. Even with a perfect cast, comedic delivery is often hard to pinpoint, especially with the elevated language found in a Shakespeare play. Stevenson’s costume design also added a whole new layer, as each actor was dressed in both modern and Elizabethan wear. Personally, a presentation of Macbeth was much more inviting when the actor was decked out in a colorful pair of Chucks and tube socks — because how could I forget the tube socks! As a whole, I was quite pleased with the technical aspects of the show. The set was simple, featuring a rather large portrait of Shakespeare adorned with a shiny diamond stud earring. I remember the portrait vividly when awaiting the first scene, as it clued me on the quirky and charming essence of this production far before the dialogue began. As much as I enjoy a grand set with spotlights and fanfare, this minimalist approach was quite comforting and suited the premise of the play. Unlike large productions, I was never strictly drawn to set pieces, leaving little of my attention to the performance itself. Instead, I was able to remain engaged with each bit of story-telling. Whether you are a fan of Shakespeare or just in the mood for some laughs, The Complete Works of William Shakespeare (abridged) [revised] has all you could want and more. With a creative and zesty take on iconic productions, you won’t want to miss this high energy, outrageously ridiculous, and wildly entertaining performance. Believe me when I say you will never look at a Shakespeare play the same.